The ICA Update is an award-winning magazine with in-depth stories about interstitial cystitis (IC) research, treatment, and lifestyle issues. The ICA Update is a benefit of donors who give $50 or more to the Interstitial Cystitis Association (ICA). Human Relations – Family, friends, coworkers—all play roles in the lives of people with IC. Family Matters – Helping those closest to us understand and live with IC. ICA 2016 Annual Report – The association’s annual review of efforts to advocate, educate, and support research that will improve the lives of those with IC. Practitioner’s Forum – Shellee Moore, LMFT, on the role therapy can play in navigating interpersonal dynamics. Friends and Coworkers – Beyond family, others in our lives also are impacted by IC. Not receiving the ICA Update? Donate now! 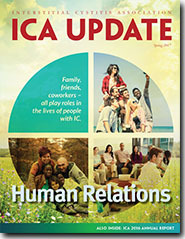 You need to be logged in to view back issues of the ICA Update. Access to the current and most recent past issues of the ICA Update is available for free to ICA donors who give $50 or more. Donors who give $100 or more receive access to ALL past issues and donors who give $250 or more receive an advanced copy electronically. Not a donor? Donate now.